Function: To sponsor high quality charter schools throughout the state of Missouri. Term length: Four years, except for those members first appointed, of which three shall be appointed for a term of one year, two for a term of two years, two for a term of three years, and two for a term of four years. 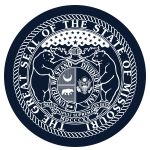 Member Requirements: Five commissioners will be selected from three-panel slates each recommended by the commissioner of education, the commission of higher education, the president pro tem, the speaker of the house, and the Missouri School Boards Association. The remaining four members shall be appointed by the Governor. Political Requirements: No more than five members may be of the same political party. Geographic Requirements: No more than two members shall be from the same congressional district.